When you're on a road trip or just on your way to soccer practice with the kids, you want everyone to be comfortable. 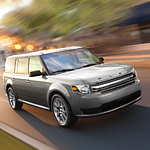 With the Ford Flex, everyone has enough room, and the available options on the seats with this popular three-row midsize SUV will keep you toasty warm in the winter and breezy cool in the summer. With seating for seven, this vehicle has plenty of room to transport family, children, friends, and pets. Plus, you'll still get the cargo space because you have the option of folding down the second and third rows. And if you're looking for a vehicle that keeps you cool or warm, depending on the season, you'll love the available features on the front seats and steering wheel. Both of these can be heated, and the seats also have the option of coming with features to keep them cool on hot days so that your skin doesn't stick to the upholstery.